Coolutils EPS Viewer 1.0 Free Download - View EPS files for free with a new freeware from Coolutils. Can't open EPS files? 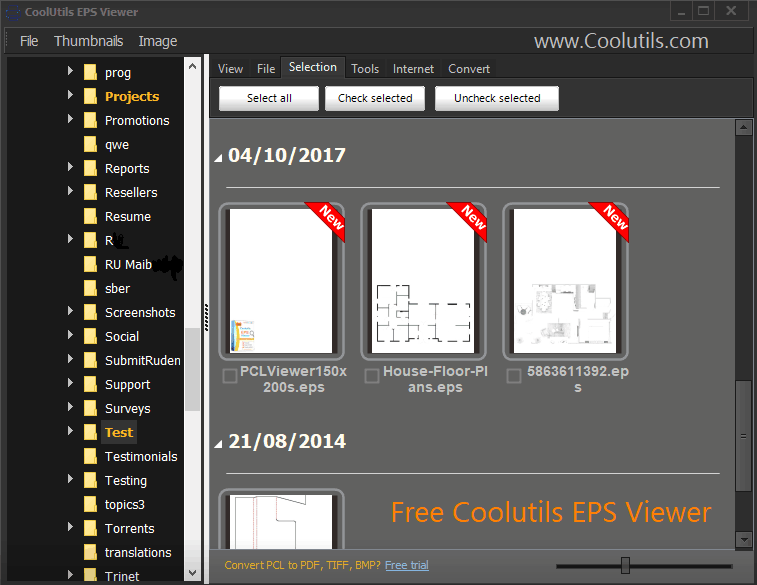 Try a new free EPS viewer from Coolutils. It deals with EPS files fast. One file or a hundred of them in several folders, you will get acces to all of them. View EPS files absolutely free! Moreover, you can move or delete files right inside one app. CoolUtils EPS Viewer helps you to view your EPS files and manage them with great ease without having to make any unnecessary compromises on file quality. It's absolutely free for non-commercial or educational use. Download your full free copy now, no ads, no bars, no adware inside. Statement: First, please download the orginal installation package by clicking the download link. Of course you may also download it from the publisher's website. Using Coolutils EPS Viewer crack, key, patch, serial number, registration code, keygen is illegal. The download file hosted at publisher website. We do not provide any download link points to Rapidshare, Hotfile, Depositfiles, Mediafire, Filefactory, etc. or obtained from file sharing programs such as Limewire, Kazaa, Imesh, Ares, BearShare, BitTorrent, WinMX etc. Software piracy is theft. If you like Coolutils EPS Viewer please buy it.